ISBN 063405158X. 5.25x7.5 inches. With Vital Information and the Historical Band. Voted Best Drum DVD 2003 by Modern Drummer Magazine! Drumset Technique (Disc One) – Steve explains hand and foot technique in unprecedented detail and gets to the core of what drummers need to know in order to improve their feel and technical skills. Segments include: hand technique • foot technique • the art of practice, exercises, licks and phrases • independence/interdependence • implied metric modulations • plus four extended solo drum pieces. History of the U.S. 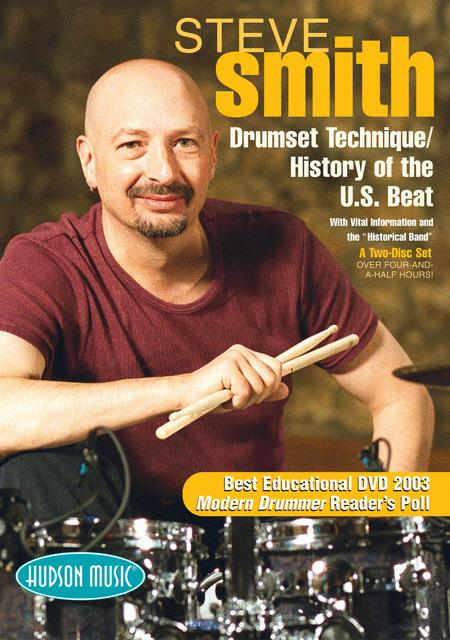 Beat (Disc Two) – With the help of an all-star band, Steve explains the evolution of the drumset in U.S. Music – how the drumset was first used in all the major styles and how closely related all the styles are. Segments include: early New Orleans jazz • big band • bebop • rhythm and blues • country • blues • gospel • rock • funk • and jazz/rock. In addition, Steve's group Vital Information plays seven complete tunes that feature applications of the techniques and complex rhythms explained in Disc One. Special Features: Extensive bonus footage including alternate-take drum solos, a brilliant hi-hat solo and hi-hat tutorial, alternate band performances, a camera-switching option, optional running commentary by Steve, a listening list, a reading list, and more! Total Running Time (for both discs): 4 hours, 38 minutes. April 18, 2008 Do I have to shave my head now? Mr. Smith is a great teacher. His lessons are both interesting and easy to understand. Well done and worth a gander for any drummer. 34 of 64 people found this review helpful.